Book Cheaper Car Hire at Nimes Airport - Lower Cost Rental Rates of Minibus, Estate, People Carrier, Cabriolet & SUV in Nimes. Get cheaper prices for MPV, SUV and car hire at Nimes Arles Camargue Airport, or get car from the TGV station or downtown depot. You have a good choice of companies who offer the same cars and service through our website, but a a cheaper price, to help save you time and money. 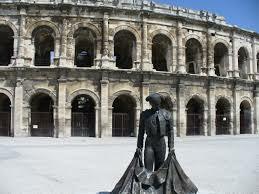 Check the prices we have in Nimes with:- Avis, Budget, Keddy & Sixt. The car hire companies are located in arrivals car hire. The hire cars are a short distance away in the car park across from the airport terminal. Go to the left of the main car park, when you exit the airport and follow the signs for parking. When returning your rental look for the Car Rental sign at the first roundabout within the airport grounds. We not only compare budget economy car rental rates at Nimes, we also compare the high demand 7 seater vans and 4x4 SUVs. You can also get your car at Nimes Train Station, or at Cour De Dion Bouton. 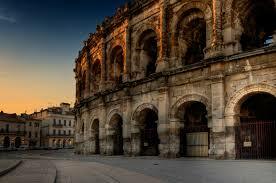 Nimes is located in the Provance region of France and is sometimes overlooked in favour of nearby Arles or Avignon. However Nimes is a fascinating town, with a rich history, offering the traveller a rare glimpse into Roman times, with so many Roman artifacts and buildings. 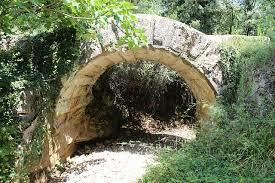 This Roman outpost also acted as a retirement home for Roman officers who had conquered Egypt. This is enshrined in the towns emblem of a crocodile and a palm tree. Nime's Roman amphi-theatre has survived mostly intact and dates from 1st or 2nd century AD. The walls, which served as ramparts, were removed under Napoleon. Compare MPV and SUV rates and suppliers at Nimes Airport. Book a discounted minivan or convertible with GPS. 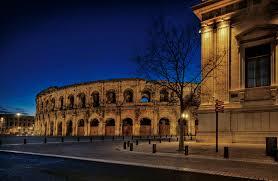 Look, book and save today and pre-book for Nimes. The theatre is still used to stage musical events and even bull fighting. It is impossible not to be impressed with the Roman Engineers, especially after seeing the Pont du Gard part, built with stone and cement to carry water across the River Gordon and forms part of a large aquaduct. 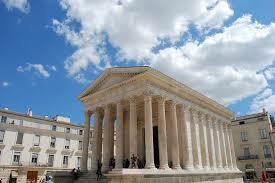 Nimes Airport (IATA code FNI) is located about twelve kilometers from Nimes, in the small town of Garons. The full name is Nimes Ales Camargue Ceveness Airport, but we will call it Nimes for short. Budget carriers fly into Nimes Airport which servers as a gateway to the French Riviera. If meant Nice, not Nimes and need a nice car, then check Nice Airport here.